"Taylor Mill is a city of the fourth class located south of old Latonia along Taylor Mill Road (KY Route 16) in Kenton County, Kentucky. As a city, Taylor Mill is relatively young, having been incorporated in 1957. However, the beginning of settlement here stretches back to the late eighteenth century just several years after Kentucky was admitted to the Union." - from www.taylormillky.gov/index.asp?page=Home_History. 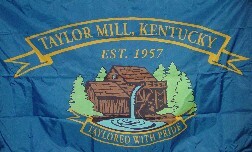 The blue flag shows a water mill scene, above a blue ribbon outlined in gold stating TAYLOR MILL, KENTUCKY and below a similar ribbon stating TAYLORED WITH PRIDE.